Rathmines Park at Lake Macquarie, NSW, Australia, was once the largest RAAF Flying Boat Base in the Southern Hemisphere. Established in 1939, the base was at one time the home for flying boats from No.’s 9 (Walrus), 11, 20, & 43 (Catalina) 40 (Sunderland & Martin) 41 (Dornier, Martin & Empire) and 107 (Kingfisher) Squadron’s. It was also a base for the Seaplane Training Flight, No. 3 Operational Training Unit and RAAF Marine Section. This section comprised a force of motorised and non-motorised search and rescue vessels, as well as stores. Rathmines is the only surviving and intact Flying Boat base left in Australia, and it is significant that it has been recognised for protection on the State Heritage Register. Catalina Flying Boats were the only aircraft to see service with the RAAF for the entire war time operations against Japan. These Flying Boats and their crews stationed at Rathmines were involved in events that ended the threat of invasion to Australia, including the mining of Manila harbour and the waters off the East Coast of China, as well as the Battle of the Coral Sea. During this time, 320 airmen and crew lost their lives, the majority on operational duty. The last of the Flying Boats left the base in 1952 and the base officially closed on November 30, 1960. 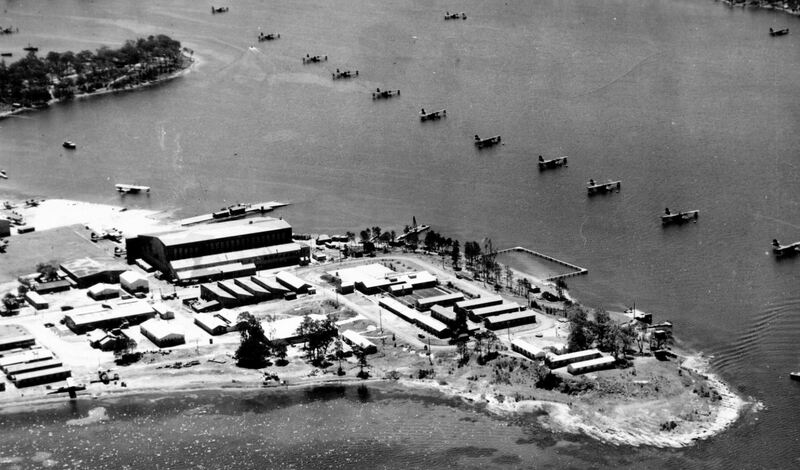 The Rathmines site on the shores of Lake Macquarie was identified as a possible place for a flying boat base in 1936, when the Director of Duties, RAAF HQ Victoria Barracks, Melbourne, gave instructions to investigate and recommend a site for a flying boat base in the Newcastle region. A ground and water survey of the bay and inlet was undertaken, and while the Rathmines site was the second recommendation, it was considered as the most likely site, and was subsequently chosen to be the site. During July 1938, No 5 Squadron from RAAF Base Richmond was sent to investigate landing areas and sites around the Lake Macquarie area for the establishment of the Rathmines Base and the eventual move of the squadron. The site comprised eighty acres (around 32 hectares) and clearing began. A camp was quickly set up as the declaration of war in Europe, in September 1939, gave urgency to become operational. Local cottages and two halls were rented to house the small contingent temporarily. In the original design of the base, all buildings were to be brick, but with impending war, semi permanent wooden framed structures covered with tin were erected as an alternative. It was fondly known in the area as ‘Tin City’. By the end of January 1940 the base was fully operational. On January 1, 1939, the No 5 squadron was renamed No 9 (Fleet Cooperation) Squadron. Further surveys of the area were made in August 1939, and in September camp was set up, and arrangements were made to rent local cottages as living quarters. The Base became operational when the No 9 Squadron transferred form Point Cook, Victoria, to Rathmines, with Seagull flying boats. Catalina flying boats arrived at the Base in February 1941, and by September 1943 the Base comprised of 14 Catalina’s, two Seagulls, a Dornier and a Dolphin. During training, many personnel brought their families to live in the towns and villages near the Rathmines Base (Kingsland 2005) which influenced the establishment of other services such as a school and post office. Rathmines was an important base for the Catalina flying boats and their Squadrons, which played a significant role in Australia’s RAAF defensive operations during WWII. The RAAF operated 168 Catalina flying boats between 1941 and 1950, flown by four front line squadrons, two communications units and three air-sea rescue flights during World War II. The Catalina flying boats were the only aircraft to see service with the RAAF for the total wartime operations against Japan. Catalina and air crews from Rathmines were involved in the defence of Australia in WWII events, such as the Battle of the Coral Sea. In 1942, a Japanese task force bound for Port Moresby was located and followed by Catalina aircraft. The extensive duration of the Catalina enabled the aircraft to remain in contact with the Japanese force and call in the navy. Reports transmitted from the aircraft allowed American and Australian navies to intercept the Japanese force, resulting in the Battle of the Coral Sea. Flying boats from Rathmines were a part of this battle, which ended with the Japanese forced to withdraw from Australian waters, effectively ending the immediate threat of a Japanese invasion of the Australian mainland. The Base was also involved with the mining of Manila Harbour, which involved 24 RAAF Catalina’s, 8 of which were from No 11 Squadron aircraft operating out of Rathmines. This operation was possibly the longest operation flown from Australia during the war. The base reached its peak strength of almost 3000 officers and other ranks in 1944-45, and was the largest flying boat base in Australia. At the end of the war in the Pacific, 320 officers and other ranks had lost their lives, mostly in air operations against the enemy.